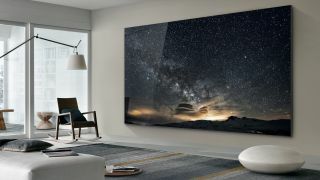 At a special First Look event held on Sunday evening, Samsung debuted two new versions of its MicroLED TV (formerly known only as The Wall) – a smaller 75-inch variation as well as a significantly larger 219-inch model. According to Samsung, the 'smaller' 75-inch TV size will go by a new monicker (The Window) while the 219-inch latter will pick up the mantle of The Wall. The screen made a huge splash last year when Samsung lauded MicroLED’s capabilities, claiming that it had near-perfect black levels akin to OLED and higher contrast. The two new TVs build on that legacy and offer two rather extreme options in terms of size when they come out sometime in the future. MicroLED, for those who missed the memo last year, uses millions of inorganic red, green and blue microscopic LED chips that emit their own bright light to produce brilliant colors on screen. It’s slightly different than OLED - which uses organic emissive elements - but, according to Samsung's spokespeople, that switch to inorganic might help the TV last longer and eliminate burn in. While Samsung couldn’t provide specifics on resolution at last year’s event, it was officially confirmed this year that its MicroLED TVs will offer 4K UHD resolution in the 75-inch model, and "something above 4K" in the 219-inch version. That’s a step down in terms of resolution from some of the 8K TVs we’ve heard about here at CES 2019, but that’s not unexpected given the nascent nature of MicroLED. Much of Samsung's presentation at the event revolved around the idea of MicroLED being modular - and thus, can be made into any number of shapes and sizes. What that means is that some day, not far into the future, we'll be able to order custom-sized MicroLED TVs... well, within reason (you can't get a 72.45-inch TV, for example, because the modules wouldn't allow for that). The other interesting point Samsung made during the keynote is about using different aspect ratios - sure, most content is made 16:9, but if you have a different ratio in mind, Samsung's MicroLED TVs would be up for the challenge. ...Unfortunately, however, you'll still need to order them through a custom-installer, so the average consumer won't have a 219-inch MicroLED TV in their house anytime soon. So how much will Samsung’s monstrous MicroLED TVs set you back? So, are you ready to shell out for a TV that costs as much as our house?